They have been dogged by rumours that their marriage is in trouble. But Beyonce and Jay Z looked very much the happy couple as they checked out a designer boutique in Paris on Saturday. And they looked perfectly dressed for the chic French capital, with Beyonce showing off her impeccable style in a plunging black and white zipper dress that featured a bright orange floral pattern on the bottom. Her make-up was flawless and she wore her hair down in natural waves, while sporting sunglasses for some of the time inside the store. Sporting a pair of business-like black heels, the singer happily scanned the racks of clothing. Jay Z, wearing a black button down shirt, black sweater, joined his wife for the shopping trip and the pair happily browsed the Colette boutique. On Friday, they were without their adorable daughter Blue Ivy, although Beyonce posted a snapshot of the two-year-old on her website. The snaps showed Blue playing a church organ as she and Jay Z visited a cathedral. And the toddler was more than happy to bang on the keys and discover where all that beautiful church music comes from. Beyonce stood behind the youngster, appearing to be giving her some direction with the keys. The singer, who turned 33 earlier this month, was wearing a printed top that was tucked into a pencil skirt while wearing her hair loose and natural. 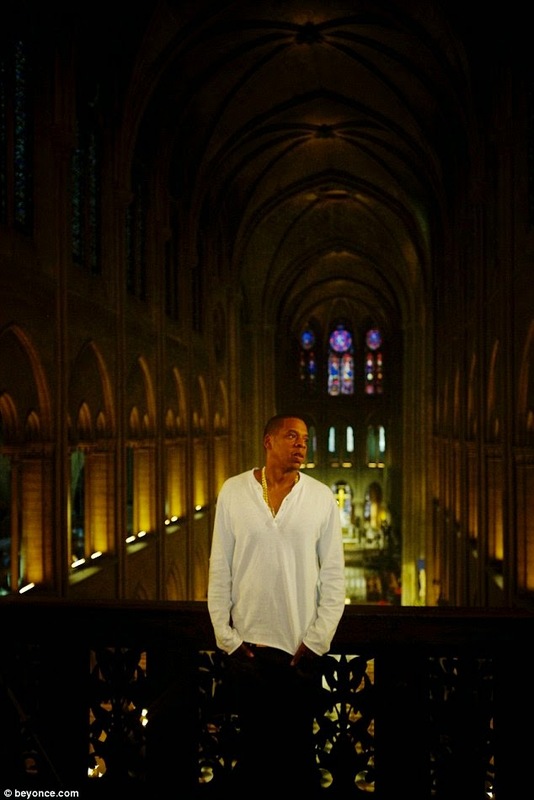 Another shot showed Jay Z taking in all the glory of the grand cathedral. He was wearing a plain white jersey and gold chains around his neck. The family then stood in front of the row of candles as Beyonce lit a candle. Beyonce and Jay Z have ridden a wave of speculation that their six-year union was on the rocks, including claims they slept in separate rooms while on their joint On The Run tour. However, the couple are said to have made a dramatic 'U-turn' after reaffirming their love for each other in an special commitment ceremony during a family holiday to Corsica for Beyonce's 33rd birthday earlier this month. According to Grazia, Beyonce decided the milestone was the perfect point to put all the negativity behind them and move forward as a couple. A source tells the magazine: 'They were joined on a private beach by Beyoncé's mum Tina, their daughter Blue Ivy and a small group of close friends and recited a new set of vows during a short but very romantic ceremony, which doubled up as a birthday celebration.